I think the sewing gods are trying to tell me something. First they send me the fabulous Ceil Chapman rose frock with an incredible draped neckline. And then they present me with the movie Walk Hard: the Dewey Cox Story. (Stay with me here.) 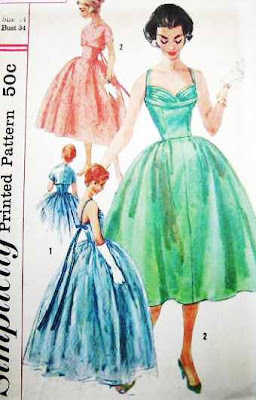 There's a scene in which one of the extras wears a dress very similar to the green one on the pattern envelope above, which I cannot stop thinking about. That draped shelf bust is so amazing, right? I've spent way too much time looking for the above pattern (Simplicity 1848, on the wiki here), striking out, and pining for it sadly. And then it occurred to me: I'm so inspired by draped designs lately, wouldn't it be helpful for me to actually learn how to drape? So I've been researching some options on classes. I took a flat pattern making class at FIT last year, and while it was interesting and informative, I would much prefer to take a class more geared toward the home seamstress rather than fashion students. I really don't need the stress of midterms and such in my life right now, if you know what I mean. Now I'm not implying that I think I'll take a couple classes and then magically turn into Ceil Chapman reincarnated. But I would love to be able to add draped details (cowls, swags, and bustles, oh my!) onto existing patterns. So I'm curious how complicated draping is to learn. Have any of you taken classes or read any books that you found helpful? Please share! In parting, a few more draped lovelies for you to feast your eyes on. Sigh! Don't you just wish you could drape up one of these gorgeous designs right now? Oh, the orange dress just took my breath away. I'm currently learning to draft flat patterns and then we'll go on to draping - and, honestly, I can't wait. Aren't there any seamstresses in your area who also give classes? That's how I learn and it's completely stress and test-free. Draping isn't actually hard at all! You just take large pieces of cloth in different shapes and play around with it on the dressmaker's dummy. You make the most interesting things that way. Anyway, my advice is to just buy a length of muslin, set your dress form up, and start playing with the fabric! After all: muslin is cheap and it can be terribly fun (and a great creative release) to just play with the material in 3D, rather than follow a flat pattern. I'd say give it a try! Have never done draping myself before-it was supposed to have been covered in the fashion course I studied at Tafe but everything was changed around and it was covered after I had left college. Next week I'm meeting a girlfriend in Melbourne (Australia) and we're planning to attend the draping exhibition being held at the National Gallery of Victoria. WE're both very excited about going. I don't have much advice to add to what you've already been given, but wanted to add my support by also stating it's really not that hard. You just have to START, be relaxes and have fun! It's ok if it first it looks like a mess, you'll quickly get the hang of it. Also, I did a quick search in my threads archive DVD (which I believe you have, do you not?) with the search term "draping" and came up with several articles on draping basics, and techiques for some specific garments. And lastly - thanks for reminding me that I should play around with draping more often! OK, I want that emerald dress! I'm a "winter," so it's definitely my color :-) I don't know a thing about draping, unless "wearing baggy clothes to cover up the fact that my waist isn't the same diameter as my head, like the model on that pattern envelope" counts. LOL. I took a patterning and draping class in college. We drafted flat patterns first and then learned to drape on a dress form. I found that it comes quite naturally (as I'm sure it will to you) and personally I think its incredibly fun. It's a very different process, but it isn't hard and it can open up a whole new way of creating any garment, not just one with draped details. Take a class, buy a book, or just go for it. This is absolutely nothing you can't handle! Have fun and keep us posted! I have the book, Draping for Fashion Design, available for about $30 used. NOT that I have done much draping, but I've read it a few times and it seems like a great, comprehensive, easy-to-understand text with very detailed drawings and step-by-step directions for gazillions of styles. And when appropriate, it combines draping with flat pattern techniques. I highly recommend The Art of Fashion Draping by Connie Amaden-Crawford. It definitely helps you with the basics and once you've got that down, you can pretty much do anything! It also teaches you how to transfer your draping into flat pattern pieces, which is pretty useful. While nothing can replace the knowledge that can be shared one-on-one by an experienced draper in a class, there are a few good books out there that can help you. My two favorites are Precision Draping by Nelle Weymouth Link, written in 1948 still find on ebay, and for more advanced work try Draping, Art and craftsmanship in Fashion Design by Annette Duburg and Rixt van der Tol. Mark your grainlines and have fun! I think draping is easier than pattern making since you can see the result of your creation immediately. Check out a draping book from the library and give it a go! What have you got to lose? Joining the chorus of those suggesting you start self-teaching via experimentation/books while looking around for the right class. You could get Benaim's "Grès" for inspiration! I have a long-standing love affair with draping and rouching, so I love all three of those dresses and will probably officially die of envy if you whip up anything remotely like them. This spring I had a local designer make me up a sarong-inspired knit dress and it was an adventure for us both...but she did it as everyone above is saying as far as the "draping on the figure" technique. FWIW, she said one of the most challenging parts for her was visualizing how the 2-D pieces were supposed to come together for the 3-D effect--she thought she had sewed things a bit wrong at the end, but she hadn't. Seems like your work on the Chapman-inspired dress has given you a head start in understanding that (and/or you have strong spatial skills!). I've never tried draping either. I'm sure you could do it. And you would probably love it. Am looking forward to seeing what you come up with and how it works out for you. Gertie, I think it would be so awesome if you would learn how to drape and then do a series of Vlogs sharing with us what you learn. Please consider it. I don't have any place near me where I could learn these things. I've checked into draping books, but it goes right over my head. I am more of a visual and auditory learner. Also, with having a toddler and other small children, I would not be able to break away to do take a class if one was available here anyhow. Another thought for you is this is the perfect time for you to learn as much as you can before you start your own family while you still have the time because being a parent takes up most of your time. So do all you can now. Don't get me wrong. Parenting is very rewarding and more wonderful than I can say. So I don't mean the above statement in a negative way. Hello, you wonderful blogger you. Draping is ridiculously easy. It´s one of those things that look tricky, but seriously, it´s a walk in a sunny park. You have sewn pleats in a skirt? You can therefore sew draped clothing. - Take a flat pattern of pretty much anything. - take generous amount of paper, preferably the same you use for drawing patterns. - Start drawing where you´d like the draping to take place. I´m talking about drawing straight lines on the flat pattern you already have. - now start pleating the paper that you have at hand. Go freely about it. Think how deep drapes you want to generate. Then pleat accordingly. - Now position the pleated paper on top of the flat pattern. - trace the lines of said pattern to the pleated one. - mark the pleats and VOILA! You have a new & shiny pattern for a draped version of another pattern that you already had. You already can wiggle with the darts. Once you get the hang of pleating drapes, you can hide any and everykinds of darts to the depths of the darts. Seriously, you really don´t wanna pay hundreds of bucks for courses that teach this thing. Think of all the fantabulous fabrics you can score with that money. All you need is transparent paper, generously of it. Trust me, it´s really easy. I've been wanting to learn more about this myself. I just finished that Simplicity 2501 blouse and loved making all the pleats in it, and it got me thinking about sewing techniques that add more dimension to a garment. If you decide to do a series on draping, I will certainly be paying close attention! Well the one book I have on draping is by Helen Joseph Armstrong "Draping for Apparel Design" ($50 textbooks.com or ebay) After reading it I am sure with a little practice you can get the hang of it. I havent had much time for practicing but knew I wanted to learn. I always read about sewing if I cant actually sew. I just ordered Metric Pattern Cutting for Women's wear $40 (amazon used) which was review by Melissa on the blog Fehr Trade. It looks really interesting. Oh and BTW the Tiffany Blue dress doesnt look too difficult to replicate. There is an interesting article in the new Sew Stylish Spring 2010 that has a technique that looks very similar to that used above for the Blue dress. Lastly I love your blog!!! For dress 2, whizz up the bodice toile without cups, put it on your mannequin, grab a piece of cloth and fold it on the bias along the neck edge, and start making the folds. Once you have the desired effect, just cut away the edges, and there is your pattern piece! It really is that easy! The band under the bust is also a bias fold. Do try it! I've never tried draping either. I'd love to take a class, but all of these comments are leading me to believe we can figure it out ourselves. I bet you'd have no problem for sure. Check youtube for videos, even. I recently purchase " The Art of Couture Sewing" by Zoya Nudleman. It is $68.00 USD. It has a big section on draping. It has inspired me and that is the next thing I want to learn to do. Of course it is a great reference for sewing, making corsets and all sorts of other things. I ADORE that blue number. Absolutely gorgeous. I've been reading up on sewing and stumbled across your blog. I am dying to learn to sew so I can start making REAL clothes without spending an arm and a leg! I'll be very impressed. I don't think I will ever get the hang of draping. I look forward to seeing your original draped creations in the not too distant future! Draping can certainly be fun, depending upon what you're trying to create. Some things are easier to drape and some are easier to make via flat pattern. I was a fashion design major at FIT and our text was Draping for Fashion Design (still have it :), so you can check that book out for reference. Would I say draping is easy, no. It's something you can spend days doing and still not feel you've gotten right, but that's really the challenge isn't it. Good luck. I never took a drape class (haha, I barely know how to sew !!) but I spend some delicious hours in an exhibit about Madeleine Vionnet, the "anti-Grabrielle Chanel" of her day, and queen of the drape. It was absolutely stunning ! I've been reading for a while but this is my first comment-- I have that first pattern in a bust 34. Would you like to have it? I know I wouldn't make it up anytime soon and the things you make are so beautiful-- I'd be happy to send it to you. Draping isn't so difficult and certainly not for one of your talent. The best way to nail draping is to play about with fabric on a dummy and see how it all falls. You arleady know more than you think you do! A lot of it is about instinct and having a feel for the cloth. chiming in here, as a sewist of 35 years now - save your money and just get a few yards of muslin and drape away. you don't even need a dressmaker's dummy - i just drape on myself. wear something fairly form-fitting that you can get on and off easily. drape out what you like, then take off the whole kit and caboodle, and make a billion markings while you take out your pins, so you can make sense of the flat pieces. as i was taught, drafting and draping just refer to how the pattern is generated (drawn on a flat surface or using fabric positioned on a figure). you can draft a 'draped' look, or drape a very tailored look. i have HUMONGOUS shoulders so i end up draping fit-in sleeves all the time. just mark your grainlines and make a bunch of markings and notes on your draped muslin so you can 'put it together' again. Hi Gertie, I am learning to drape too. I had made just one piece this year (and I loved it do death). I will probably continue to make clothes by draping. I have never learned draping (just jumped in and do it) and my 2 kids (although teenage now) still takes up alot of my time. Hardly enough for me to learn much (I'd be fortunate to sleep 4 hours a day). Trudy is right, it's true that you should learn before baby arrives. Draping is fun and creative. Have fun! I know this blog post is from 2 years ago but I just saw this dress and had to send you the link. The bodice on the first dress is swoon-worthy!